Ivy Lockwell is many things. She is a thinker. She is a lover of books. She is the eldest of three girls. She is the daughter of a mother who desperately wants her to marry—despite the fact that Ivy has no dowry, hence no chance of catching a gentleman. She is also deeply devoted to her family…and that devotion leads her into a world of magick, mysterious men in black tophats, and the stern and quiet Mr. Quent. According to the cover copy, Galen Beckett began writing The Magicians and Mrs. Quent to find out what might happen “if there were a fantastical cause underlying the social constraints and limited choices confronting a heroine in a novel by Jane Austen or Charlotte Bronte.” He goes a long way toward answering that question. All the same, there was something peculiar about the house on Whitward Street, just as there was something peculiar about the bookish habits of the eldest Miss Lockwell. Thus, while people regarded both of them well enough, people also tended to leave well enough alone. 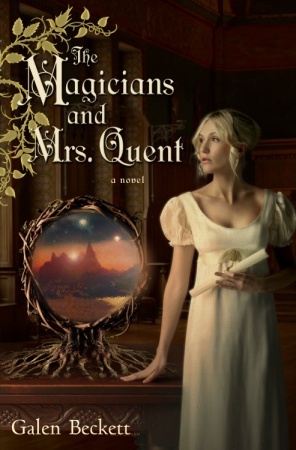 With such poignant observations about the nature of people, it might come as no surprise that the characters in The Magicians and Mrs. Quent are vividly drawn. The image of Ivy Lockwell walking down Whitward Street reading a book or Mr. Rafferdy flashing that dashing grin become lifelike because the author has an astute understanding of human beings and what makes them, well, human. He also seems to know much about the relationships people have with one another, such as the relationship between Ivy and her two sisters. As the book-loving eldest daughter of three girls myself, I found myself grinning time and again at these scenes. These are characters I could not help but be drawn to. They became real to me. I felt that The Magicians and Mrs. Quent lost some of its charm when it left the city of Invarel. In Invarel, there are all sorts of places for Ivy to go and people for her to run into. It makes for something new at every turn, while in Heathcrest, everything is much more static. I felt that it had a negative effect on that section’s story pacing. Another personal issue I had was that a certain subplot turned out quite the opposite of how I wanted. But there is to be a sequel, and I’m holding out hope that things will right themselves in the end. Even if they don’t, The Magicians and Mrs. Quent is a book to read again and again—in fact, it’s my favorite book I’ve read this year, one of my favorite books I’ve ever read. Fans of Jonathan Strange and Mr. Norrell will want to give it a try. It is a comedy of manners, a romance, a mystery, and a dazzling fantasy tale. If Jane Austen had been a fantasy writer, she would have written this book. Love this review and I must get hold of this book! I’ve got a copy of this book, too. Also, very nice review. This author published a six-book set entitled The Last Rune under the name Mark Anthony.